Participate in a Live Video Broadcast with the JR in May! The seafloor we are drilling right now formed at a superfast rate, even though it would seem superslow to us. To find out how something that seems to be superslow can be superfast, read on. If you were being chased by a spreading seafloor, to get away from it, you would not have to worry about whether it is better to run uphill or downhill or if you should climb a tree or not, because you could definitely outrun it. The seafloors on Earth right now spread at a rate between less than 1 cm a year and 13 cm a year. In comparison, our fingernails on average grow at a rate of 3.6 cm a year, so if your fingernails were racing some of the slower seafloors, they would actually win. This seems superslow to us. For example, if a seafloor was spreading at the rate of 6 cm a year, and you wanted to move your bed six feet across your bedroom at the same rate of 6 cm a year, it would take you 30.48 years to move it that far (if you decide to do that, hopefully your parents won’t mind you living with them until you’re middle-aged). We call this area of seafloor below us in the Cocos Plate “superfast” because when it formed 15 million years ago, it was spreading at a rate of 20 cm a year. This is much faster than any ocean floor spreading today (remember they are all spreading at rates between less than 1 cm per year and 13 cm a year). 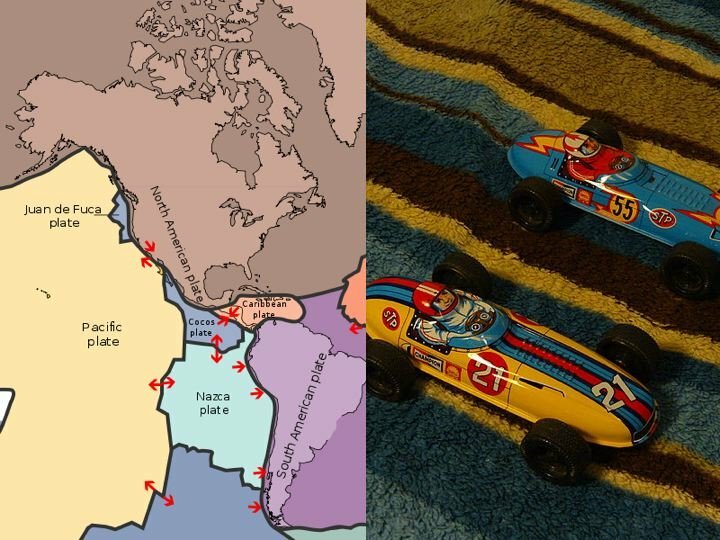 To give you an idea of the differences in speed, let’s say the seafloors were all in a car race at speeds in proportion to the rates they originally spread. If the crust spreading at 6 cm a year was driving 60 mph, then the fastest crust on Earth right now would be driving at 130 mph. As fast as that is, the superfast crust we are drilling in would be lapping all those crusts over and over again because it would be driving 200 mph (it would also be lapping your fingernails a lot, which would be driving 36 mph). So compared to the spreading rates of other crusts, the crust below us really was formed superfast. It is also superfast in comparison to the age of the Earth, but seems superslow compared to the age of most people (we’re “hasty” compared to seafloors, like hobbits are compared to ents), but I will have to go into more detail on that in my next blog. See you then!